Ten thousand years ago, before any other livestock species had been tamed, villagers at Ganj Dareh high in the Zagros Mountains of what is now Iran made a pact with wild goats. They would tame, feed, and protect the goats; in exchange, the goats would provide their human caretakers with meat, milk, hides, hair, horn, bones, sinew, and dung for fuel. It’s been a marriage made in heaven ever since. Soon after, also in the Middle East, humans domesticated sheep. With animals to carry their packs, fiber to fashion warm clothing, and a walking food supply, Stone Age man and woman set out to populate the world. goats and produce, market, and sell their milk and cheese. For ancient races, goats and sheep were life. Bride prices and dowries were paid in goats and sheep. Lambs and kids were sacrifices to the people’s gods. 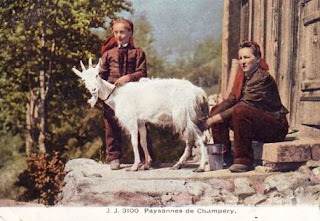 In some cases goats were the people’s gods, or their gods had goaty attributes, such as goats’ legs and horns. Wealth was reckoned in sheep and goats — sometimes hundreds and thousands of sheep and goats. Milk byproducts found in Stone Age pottery from Turkey indicate that processed milk — cheese — was consumed as early as 6500 B.C., thousands of years before adult humans evolved the ability to digest raw, fluid milk. Similar residues were unearthed at British archaeological digs dating to 4500 B.C. Goats have long been called the poor man’s cow because they are browsers, not grazers, and they survive, even thrive, on rough land that couldn’t support the hardiest cow. 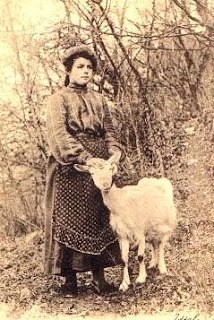 Because of this and the ease of crafting basic goat cheeses, goat cheese has long been considered peasant’s fare. The Moors brought goats to the Loire Valley and Poitou in the 8th century A.D., where scores of French goat cheeses, chèvres, evolved. 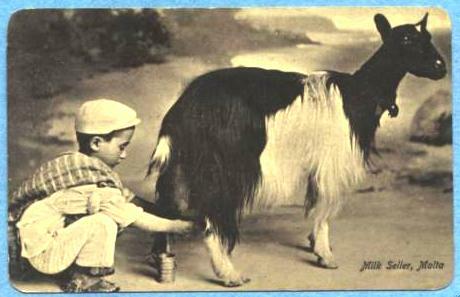 Catalans in Spain developed mató made with milk from goats or cows. The Greeks created feta, mizithra, and anthotyros cheeses made from a blend of goat and ewe milk. Italy has caparino of many kinds. Brunost (brown cheese) from Norway is made of goat’s milk. Pant-ysgawn and gevrick are Welsh and Cornish goat-milk cheeses. But goat cheese isn’t peasant fare any longer. A delicately spicy Dutch goat cheese, Bettine Grand Cru, was chosen Best Cheese of the World out of 2140 contestants in the 2006 Nantwich International Cheese Show in England. Le Cendrillon, a soft-ripening, ash-covered goat cheese from Quebec beat nearly 2,500 cheeses from 34 countries to win the grand prize at the International Cheese Awards festival last year. Everyone is eating goat cheese. You should try it too. To learn about raising your own goats for milk and cheese, see Storey's Guide to Raising Dairy Goats. 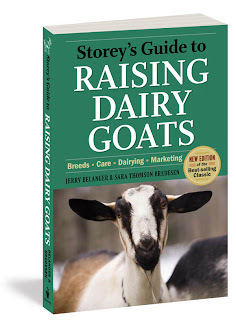 And, if you are interested in making goat cheese from your own goat's milk or from purchased goat's milk, Storey's books The Home Creamery and Home Cheese Making have wonderful (and easy) recipes. Additionally, many of our cookbooks have recipes using goat cheese. See Tuesday's post Roasted Eggplant with Goat Cheese, for a goat cheese recipe from Dishing Up Maryland.